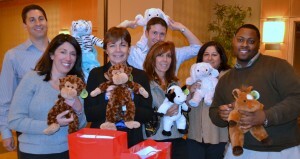 Covanta Energy, a company that turns waste into energy, strengthened its team with a Rescue Bear team building activity and put cuddly, stuffed animals into the arms of kids at Goryeb Hospital in Morristown, New Jersey (Greater New York Area). Remember when you were four or five – a lot of things were scary. One of the biggest, baddest, scariest things for a child, is being hospitalized. Even the doctors who are there to help them get well, may seem like giants wearing masks. And now the hospital has a host of cuddly animals, dressed like doctors and nurses, courtesy of Covanta Energy, to help them demonstrate what will happen to them. The animal will get the IV first. He won’t cry or even be frightened, and he is now the child’s best friend. He is there to rescue the child. Covanta employees learned about themselves and each other. What makes each personality type unique, and how they relate to each other. As they learned, laughed, and figured it out, they stuffed and dressed “Rescue Bears” cows, horses, monkeys, and bunnies” for children who really need rescuing, a gentle hug from a little friend, dressed in his “doctor” or “nurse” best. with a mask like the doctors will wear.